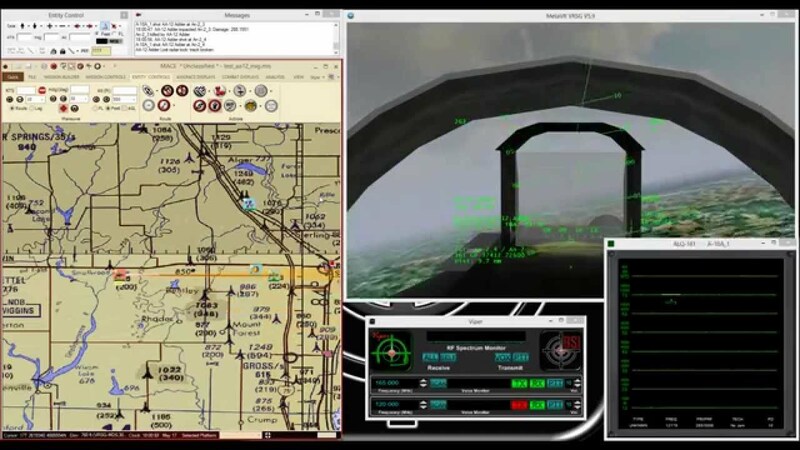 Videos | Battlespace Simulations Inc. 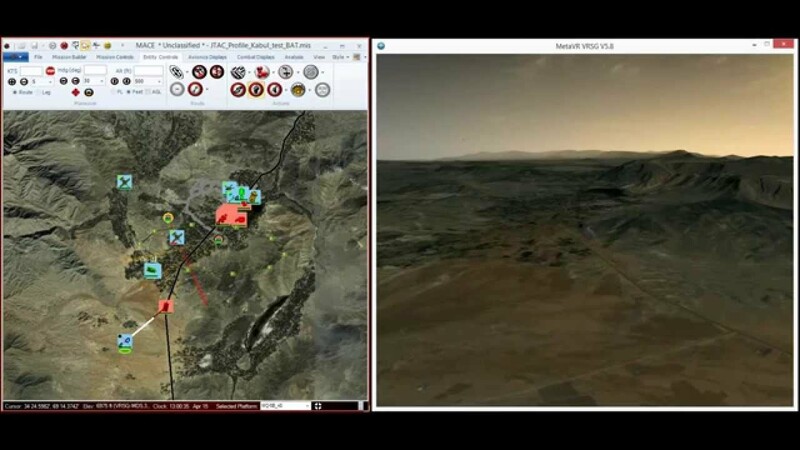 This video demonstrates BSI’s Modern Air Combat Environment (MACE) software. MACE is a full-spectrum CGF/SAF and is accredited for Type I, II and III controls for Joint Terminal Attack Controller (JTAC) Training in various fielded training systems, including the Advanced Air National Guard JTAC Training System (AAJTS), the AFSOC JTAC Simulator (AJS) and ACC’s JTAC-TACP/Operational Simulation Suite (J-T/OSS) 2.0. Shown here rendered by MetaVR’s Virtual Reality Scene Generator. Many thanks to one of our FAC/JTAC Training Partners Close Air Solutions for the support in production of many of these product training videos. This is the first of several MACE Tutorial videos & provides an overview of the MACE Graphical User Interface (GUI) including the Ribbon Bar, Quick Access Toolbar, Mission Area and Status Bar. 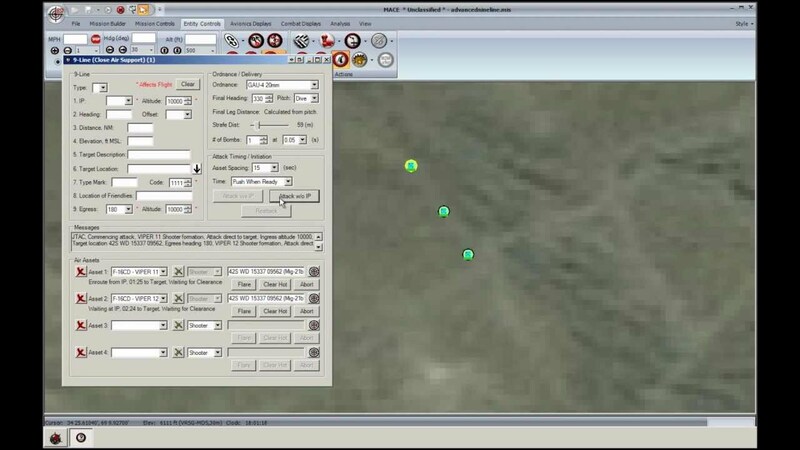 This is the second of several MACE Tutorial videos & covers how to configure data paths (for elevation, maps, imagery and vector data), and how to interact with the MACE map. This MACE Tutorial video covers the different object types in MACE (platforms, sites, culturals and waypoints) and how to interact with them. It also covers the differences between Intent and Delta states, group selection, and an introduction to the Platform Properties Window. This MACE Tutorial video covers control of entities at runtime, with a focus on building routes using waypoints. It also covers road attachments and waypoint actions. This MACE Tutorial video covers platform controls and semi-automated behaviors, including attachments, roof-clamping, formations, reaction postures, weapons postures, teams, rally points and basic weapons engagements. This MACE Tutorial video covers advanced platform controls and semi-automated behaviors, including collision avoidance, pathfinding, random walks and Aggregates. 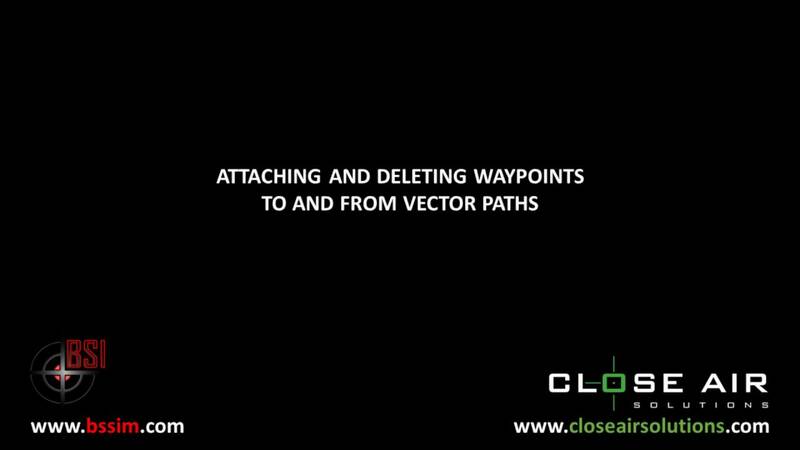 This MACE Tutorial video covers basic use of the MACE 9-Line for simulation of Close Air Support missions. This MACE Tutorial video covers advanced use of the MACE 9-Line for simulation of Close Air Support missions. Covered topics include bomb-on-coordinate, multiple target attacks, buddy lasing, and time-on-target/time-to-target attacks. This MACE Tutorial video covers visual settings for using MACE with MetaVR’s VRSG image generator and how to program/load/save joytsick and window configurations. This video demonstrates how to use MACE’s new Shape editor. Users can add or edit line and polygon vectors, which can be used in MACE for road following and/or auto-avoidance/pathfinding. This is a quickly made video to answer a customer question. 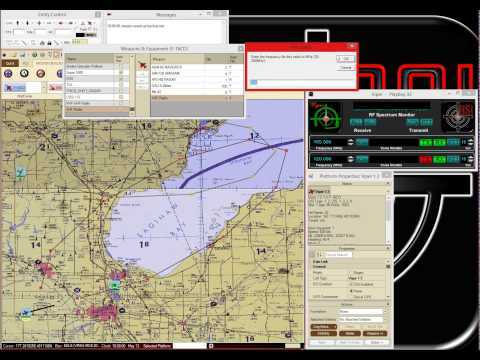 In this video, you can see how you can use Google Earth or any other suitable KML viewer and DIScord for situational awareness and after action review. This video shows the JTAC Immersive Dome, a joint venture between BSI, MetaVR and Immersive Display Solutions (IDSI). 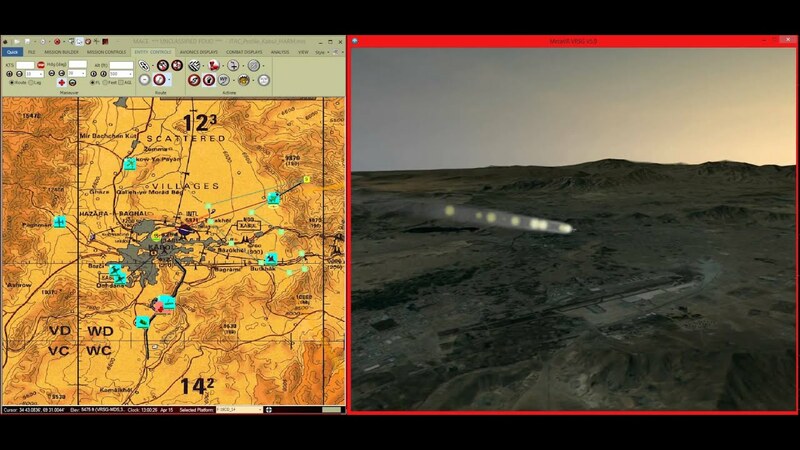 This commercially available JTAC training solution is accredited for Type 1, 2 and 3 Day/Night/Laser training by the JFS ESC. 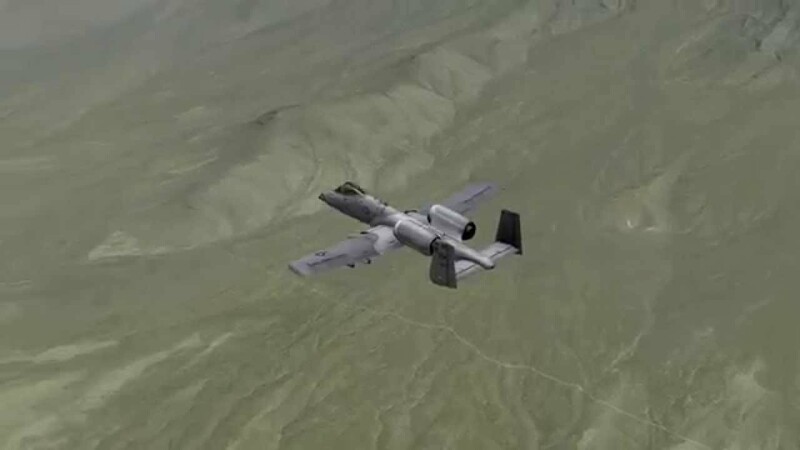 In this video, an A-10 is assigned and routed to a target using MACE’s Close Air Support 9-Line interface. 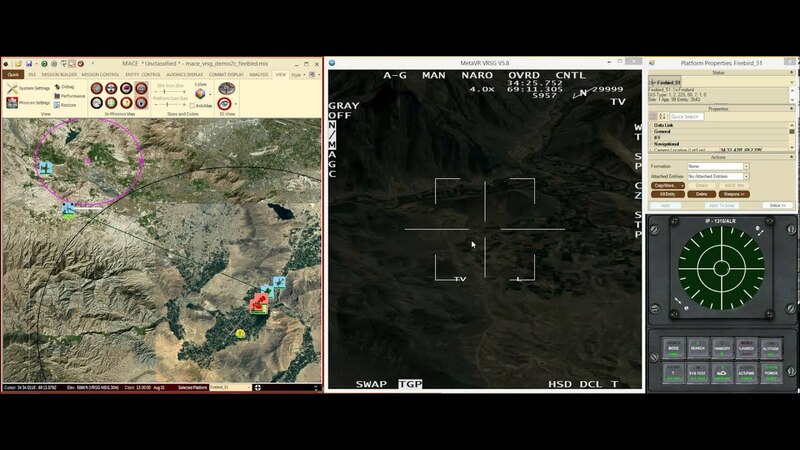 In this MACE mission, a JTAC designates a target for an A-10’s GBU-12. The A-10 is tasked via MACE’s 9-Line interface. MACE also supports Call for Fire and 5-Line interfaces for Gunship Close Air Support (CAS). Shown here with MetaVR’s Virtual Reality Scene Generator. 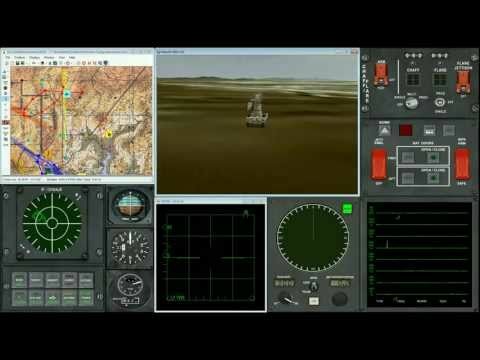 This video gives an overview of how one can use the 5 Line form in Battlespace Simulations’ Modern Air Combat Environment (MACE). The video covers the uses of fixed wing gunships and the use of rotary wing assets. 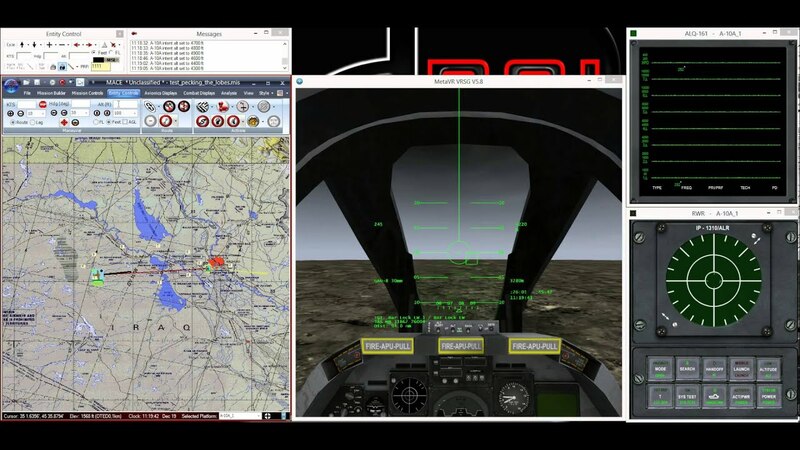 This video shows recent improvements to the 9-Line interface in BSI’s Modern Air Combat Environment (MACE). 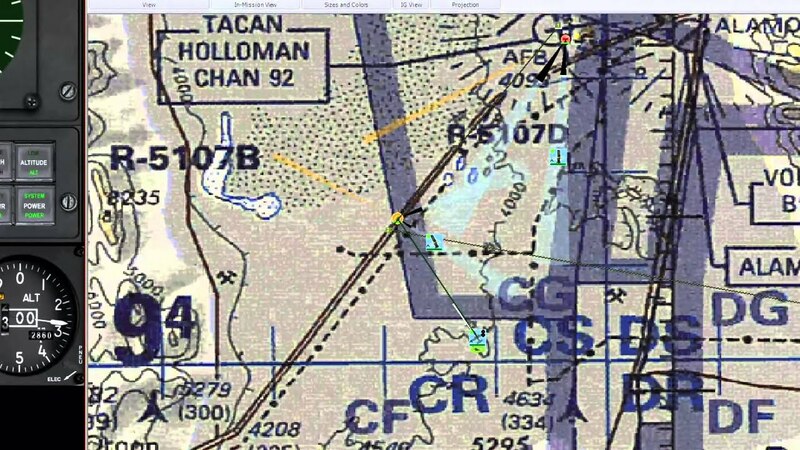 In this video, two F-16’s are tasked to perform a strafing run, and pop flares on ingress to aid the JTAC in identifying their location. Shown here with MetaVR’s Virtual Reality Scene Generator. 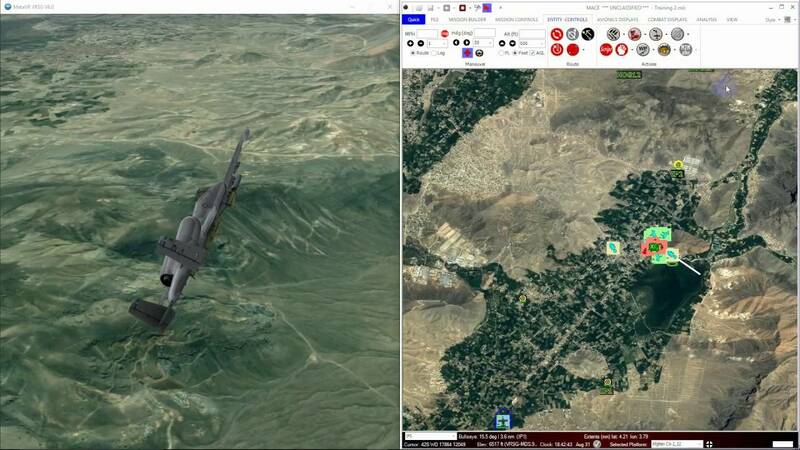 In this video, a simulated MQ-9 in BSI’s Modern Air Combat Environment (MACE) executes a stand-alone unmanned SEAD mission, armed with 2xADM-160C MALD-J and a GBU-12. Shown here rendered by MetaVR’s Virtual Reality Scene Generator. In this video, I add a Firebird UAV to an existing MACE misison. I attach a camera (shown here using MetaVR’s Virtual Reality Scene Generator) to the Firebird which I control through MACE’s joystick interface. Performing the role of the Firebird sensor operator, I detect a MANPAD launch and identify a group of hostiles which is engaging a friendly convoy. Shown here rendered by MetaVR’s Virtual Reality Scene Generator. 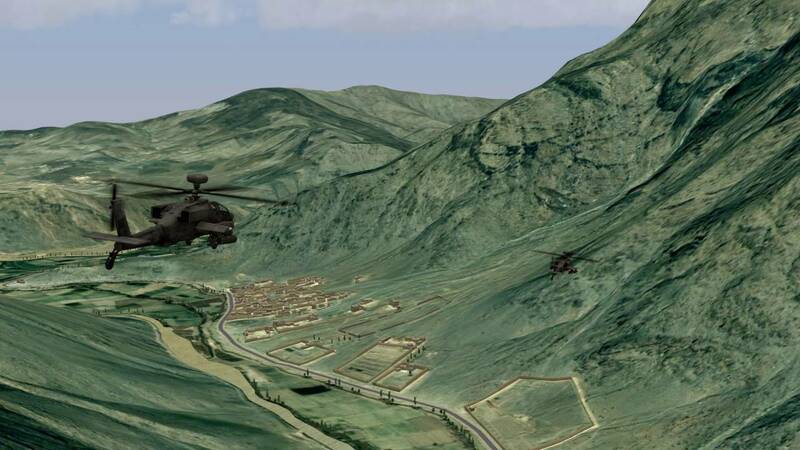 This video shows a UAS training scenario using MACE and MetaVR’s Virtual Reality Scene Generator. 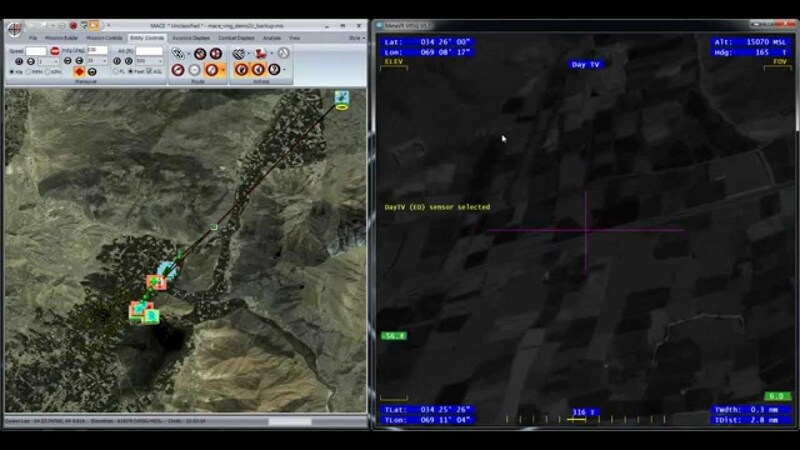 In the video, the MACE user is controlling a UAV camera and notices an insurgent digging a hole near the side of a road, with what looks like an IED nearby. A friendly convoy is approaching this location. The UAV operator launches an AGM-114 which strikes the target, but additional insurgents exit a truck across the street under the cover of some trees and engage the friendly forces. The UAV catches an SA-7 launch on camera, after which an A-10 is called in and launches an AGM-65 Maverick at the enemy, clearing the way for the convoy. 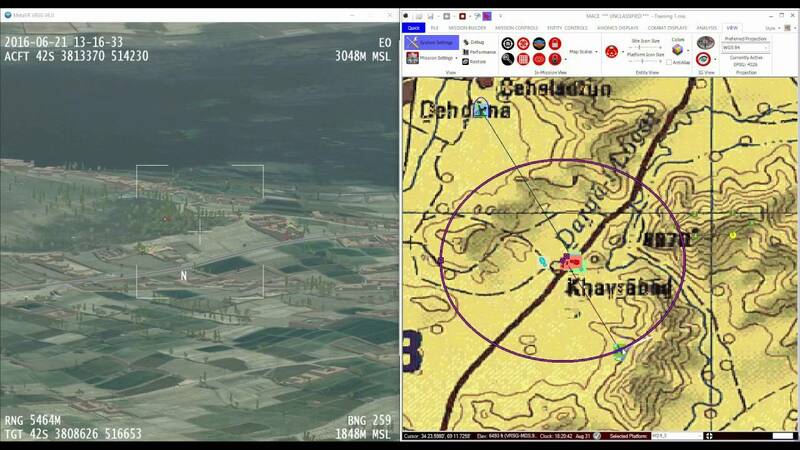 This video demonstrates a head-to-head engagement between a virtual A-10C and a virtual SA-8. 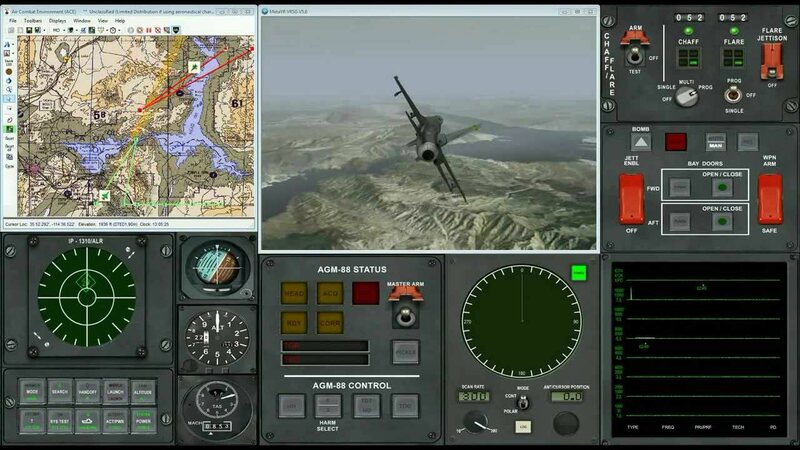 The A-10C station was configured using Modern Air Combat Environment (MACE) and MetaVR’s Virtual Reality Scene Generator (VRSG). The SA-8 is simulated within BSI’s Device Simulation Container (DSC). It also uses VRSG to create the optical tracker. 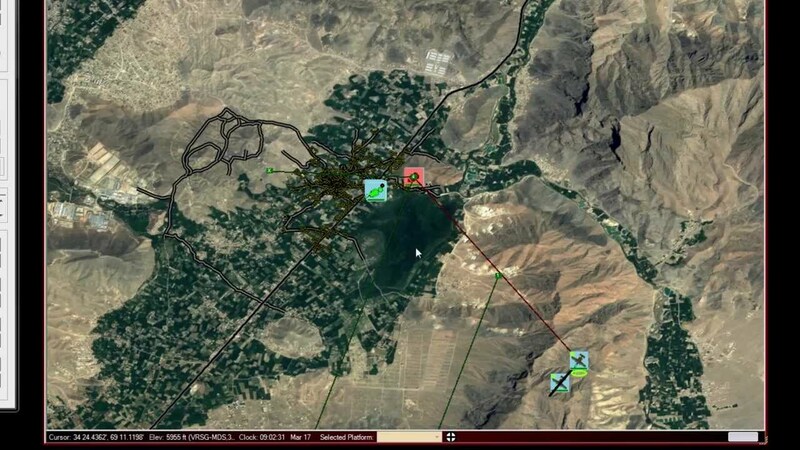 The SA-8 operator managed the task saturation of manning all three stations and engaged an encroaching A-10C. The A-10C pilot used chaff and maneuver to defeat the incoming missiles and safely escape. This video shows a MACE mission in which an F-16CJ shoots an AGM-88 HARM missile at an SA-15. The HARM enters a Flex mode for the first 15 seconds of its flight, as it detects no radiation. Once the SA-15 transmits, the HARM guides; however the SA-15 is able to detect, track and successfully intercept the HARM missile. Shown here rendered by MetaVR’s Virtual Reality Scene Generator. This video shows a MiG-29 shooting AA-12 Adder missiles at several targets. Shown here rendered by MetaVR’s Virtual Reality Scene Generator. 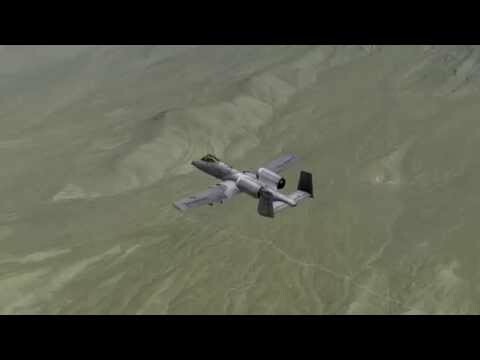 In this video, I’m flying an A-10 and ‘pecking the lobes’ of a Bar Lock Early Warning radar. Each time I pick up the Bar Lock (meaning, the Bar Lock can also see me) I descend a few hundred feet to get below the curved earth line-of-sight/radar horizon of the Bar Lock. In this video, an MQ-5B Hunter UAV launches a GBU-44/B Viper Strike at a moving tank. All UAV platforms in MACE can control sensor payloads, carry jamming pods and launch weapons. Shown here rendered by MetaVR’s Virtual Reality Scene Generator. This video shows an F-16 in BSI’s Modern Air Combat Environment (MACE) directed to land at a runway in Burlington, Vermont. 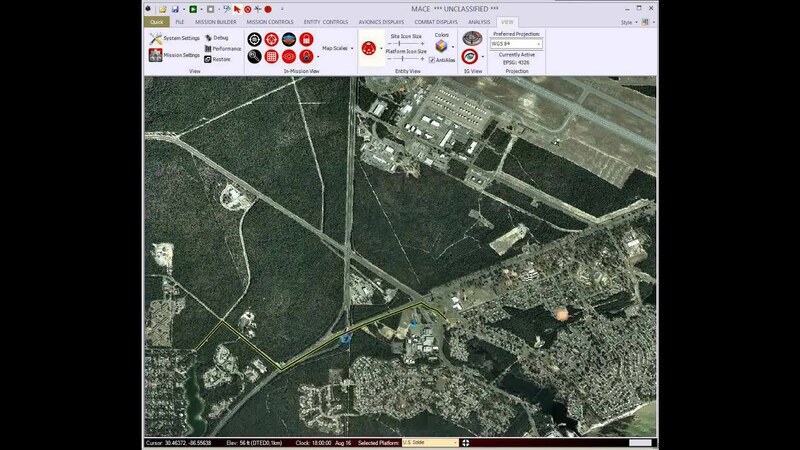 MACE can simulate a full range of combat operations at the tactical and mission level in addition to Air Traffic Control (ATC) capabilities as demonstrated in this video. Shown here with MetaVR’s Virtual Reality Scene Generator. 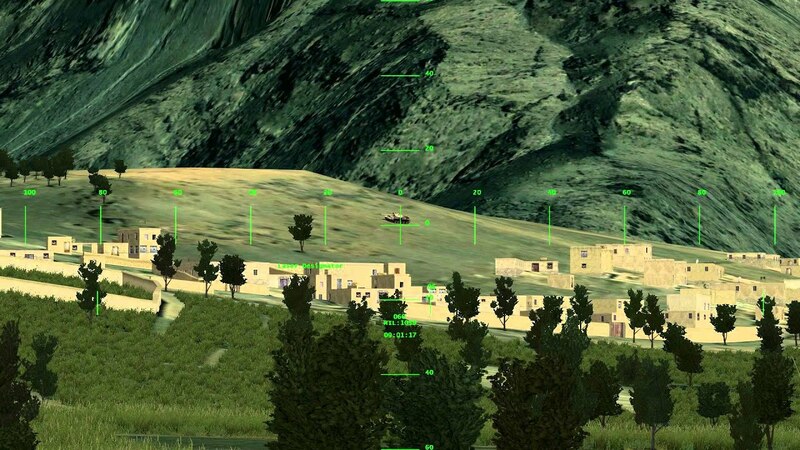 This video shows BSI’s new SA-8 Virtual SAM (surface-to-air-missile) simulation. All three stations are simulated; acquisition, tracking and the commander’s station. 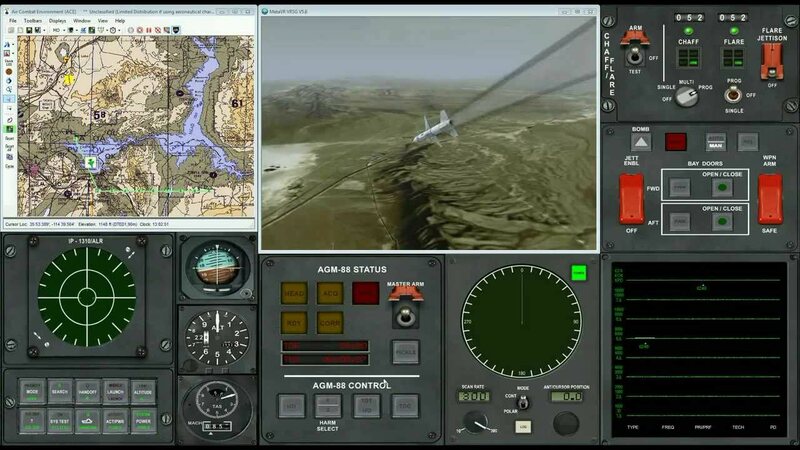 The Virtual SA-8 interfaces with BSI’s MACE software, controlling the radar activity and passing missile launch commands to MACE, which then simulates the missile fly-out towards the target. Shown here rendered by MetaVR’s Virtual Reality Scene Generator. 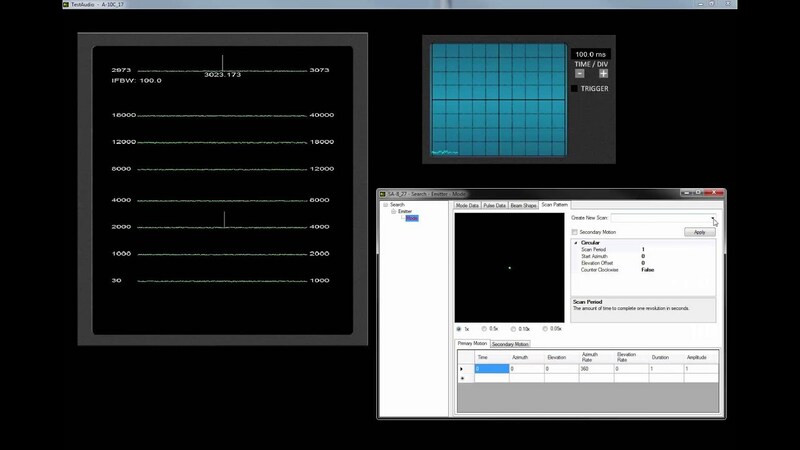 An overview of BSI’s new Signal Generation Engine (SGE) including the user interface for defining beam, scan and pulse patterns and the corresponding emitter audio generation. An F-16CJ shoots an AGM-88 HARM at a 2S6 (SA-19) site, shown here with MetaVR’s VRSG. Also shown is BSI’s Radar Warning Receiver (RWR) based on the AN/ALR-69 and several other avionics and combat displays that are included in MACE. In this video, an F-16 shoots down a MiG-29. Shown here rendered by MetaVR’s Virtual Reality Scene Generator. In this video, a SAM searches for, then tracks an F-16. The F-16 engages a MiG, and maneuvers into the SAM’s range; the SAM shoots but misses. BSI’s Air-to-Air radar is used to find and lock the MiG. Shown here with MetaVR’s Virtual Reality Scene Generator. This is the first of several MACE Tutorial videos. It provides an overview of the MACE Graphical User Interface (GUI) including the Ribbon Bar, Quick Access Toolbar, Mission Area and Status Bar. This is the second of several MACE Tutorial videos. 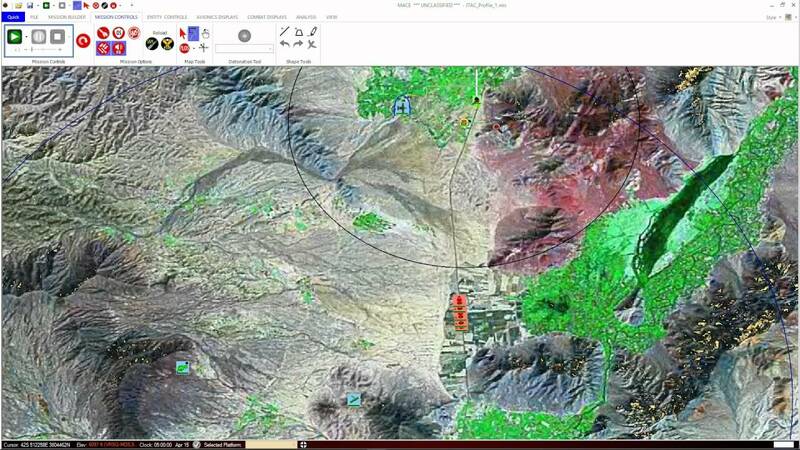 It covers how to configure data paths (for elevation, maps, imagery and vector data), and how to interact with the MACE map. This is a MACE Tutorial video. It covers the different object types in MACE (platforms, sites, culturals and waypoints) and how to interact with them. It also covers the differences between Intent and Delta states, group selection, and an introduction to the Platform Properties Window. This is a MACE Tutorial video. It covers control of entities at runtime, with a focus on building routes using waypoints. 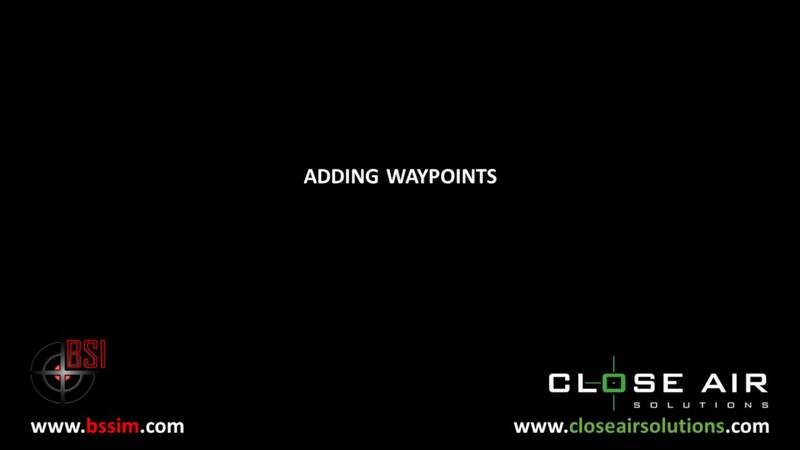 It also covers road attachments and waypoint actions. This is a MACE Tutorial video. 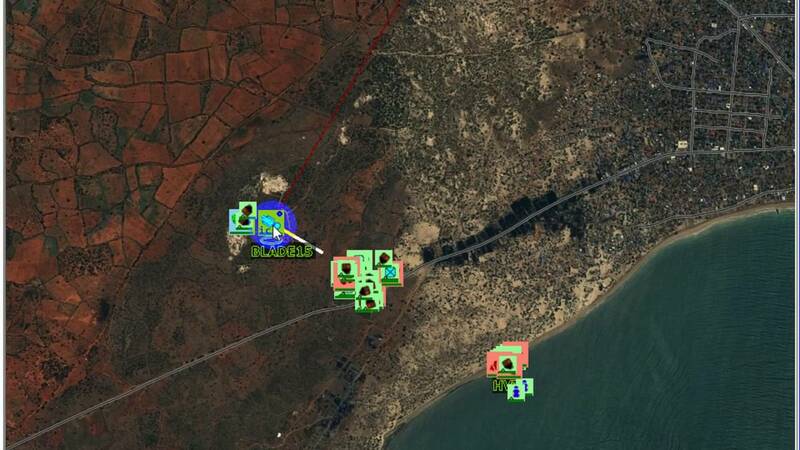 It covers platform controls and semi-automated behaviors, including attachments, roof-clamping, formations, reaction postures, weapons postures, teams, rally points and basic weapons engagements. This is a MACE Tutorial video. It covers advanced platform controls and semi-automated behaviors, including collision avoidance, pathfinding, random walks and Aggregates. This is a MACE Tutorial video. 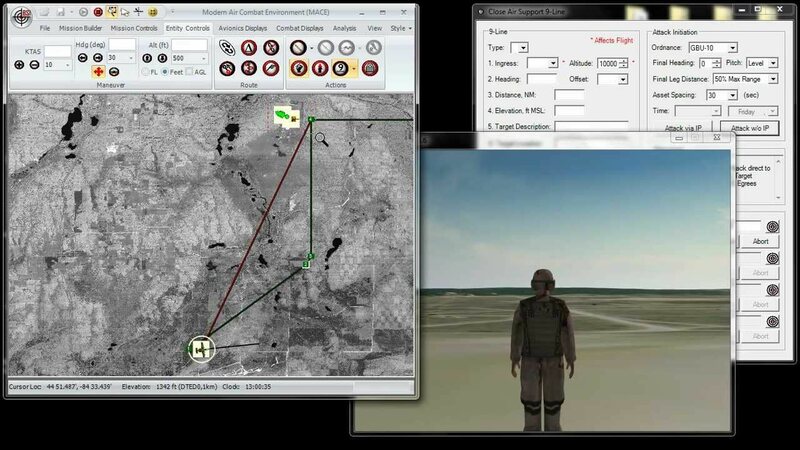 It covers basic use of the MACE 9-Line for simulation of Close Air Support missions. Be sure to check us out on YouTube & subscribe! 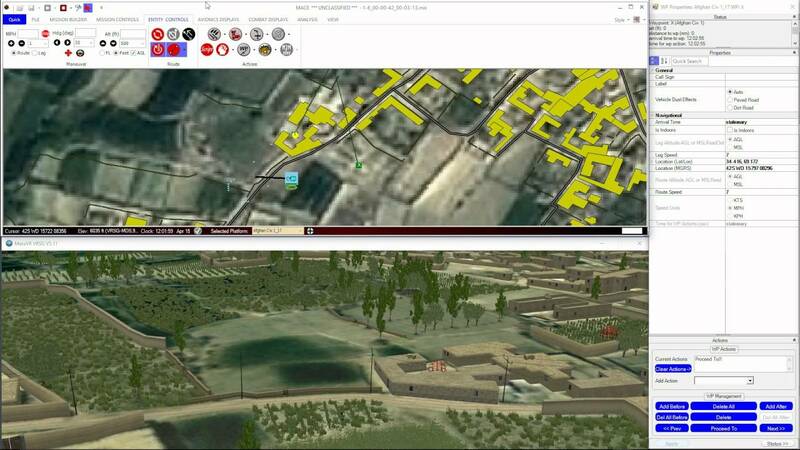 This video shows BSI’s new SA-8 Virtual SAM (surface-to-air-missile) simulation. All three stations are simulated; acquisition, tracking and the commander’s station. They can be configured to run on the same computer, with one operator, or on 3 different computers, each manned by a separate operator, as in the real system. 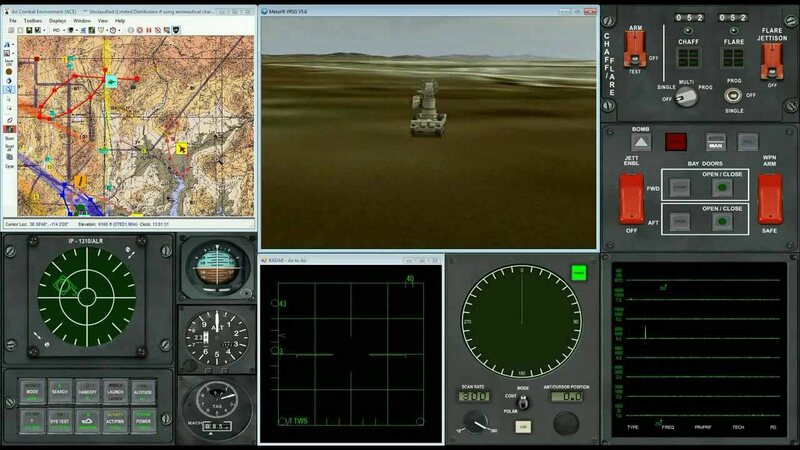 The Virtual SA-8 interfaces with BSI’s MACE software, controlling the radar activity and passing missile launch commands to MACE, which then simulates the missile fly-out towards the target. Shown here rendered by MetaVR’s Virtual Reality Scene Generator. In this video, a SAM searches for, then tracks an F-16. The F-16 engages a MiG, and maneuvers into the SAM’s range; the SAM shoots but misses. 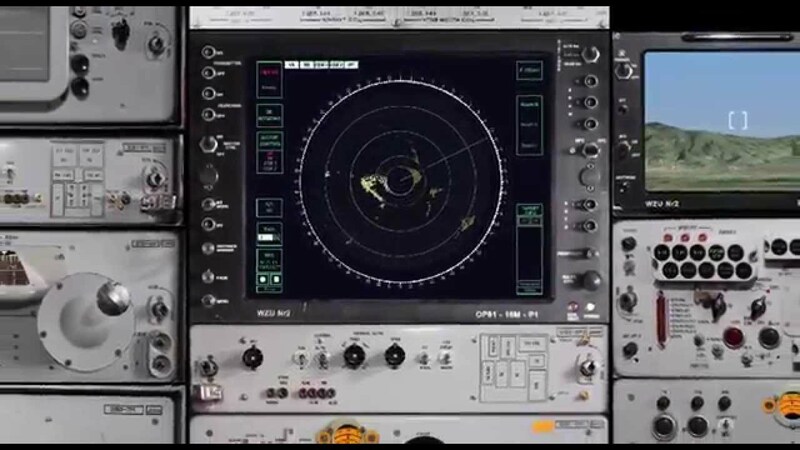 BSI’s Air-to-Air radar is used to find and lock the MiG. 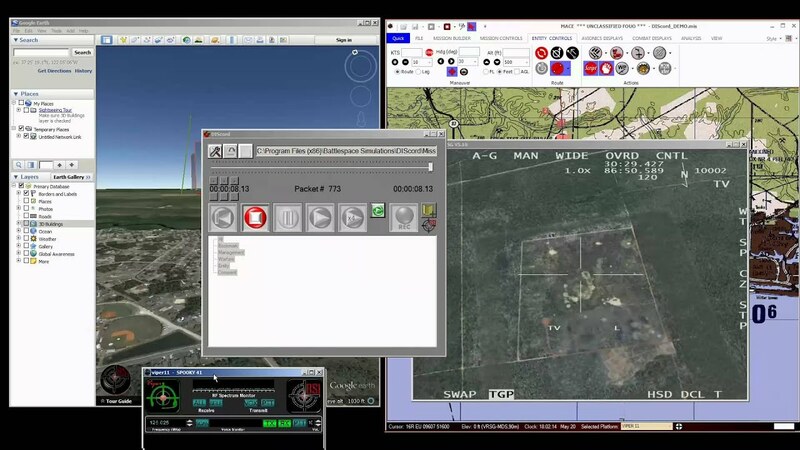 This video shows how to configure BSI’s Modern Air Combat Environment (MACE) and Viper DIS Radio for voice recognition and synthetic response. 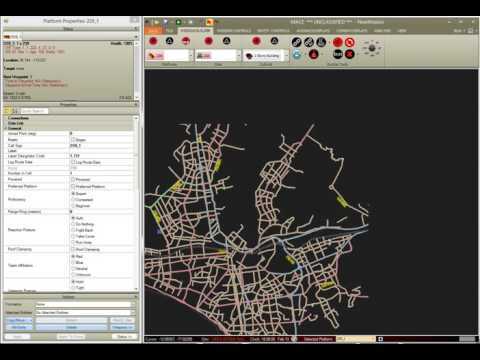 This video demonstrates MACE connecting to 2 new GIS databases we’ve developed, both of which are derived from the OpenStreetMap database. 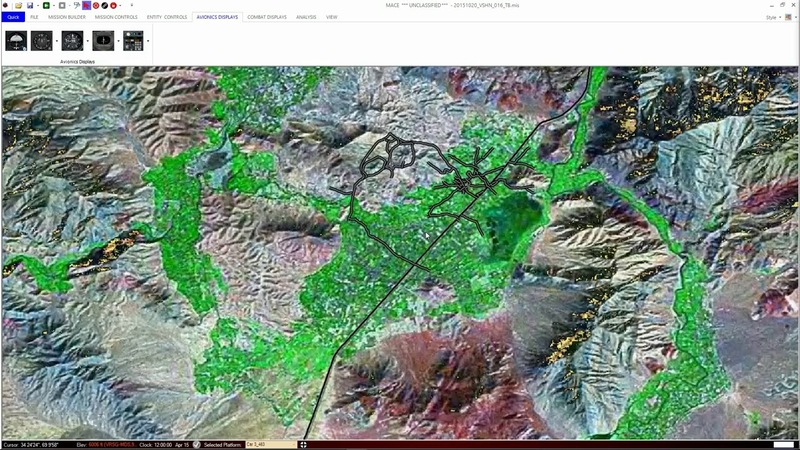 The first is a worldwide road vector database, containing primary and secondary roads for the planet, and the second is a rasterized presentation of the OSM database. MACE 2016R1 supports both of these databases, which run in separate Linux Virtual Machines (and can be run from any Windows computer).